From your face, I may read your capability, qualifications, feelings and thoughts. Even a clever actor cannot hide those elements, because even the heaviest makeup cannot conceal them from face reading. From the past, people believed that they were born with a certain destiny, which they could not alter. Yet at the same time, they also wanted to believe that there was something they could improve by effort and the changes show. Faces alter with time. The changes reflect not only age, such as wrinkles but the way people have lived. There is a Korean saying that people must be responsible for their faces from their 40s, because the face reveals everything about their lives without reserve. I don't deny that our lives are full of unexpected dynamics. While a lot of our life stories are told by saju, we must open our eyes and ears wide to read and hear what are told by one's face and voice. "Eolgul," the Korean world for face, means that the face contains our spirit as "eol" means spirit or soul. As this indicates, our face reveals our love fortunes, popularity, career, money fortunes, interpersonal skills, activities and so forth. It is not a surprise that some companies hire a face reader when they interview prospective employees. In this case, face reading influences work assignment as well as recruitment. In Oriental studies, scholars considered humans the most precious and numinous creature in nature. The head symbolizes heaven and the two feet stand on earth. Humans have two legs and arms (four in total), as if there are four seasons. The yin, yang and five elements represent human organs. The five viscera and the six entrails are like the five great oceans and six continents. The 365 days manifest as 365 key meridian points of energy, or "qi," flow in a human body. There are 12 major meridians as there are 12 hours a day. Two hours are the Oriental concept of time unit then it turns out 12 hours per day as they divided 24 by two hours. Two eyes represent the sun and the moon, blood is a river, bones are rocks and stones, a nose and forehead (those protruding parts) are mountains and hairs are plants and trees. They regard humans as a small universe and try to find the order of nature through the protruding and hollow parts; gradual and rich shapes in human body. In a human body, the face must be the best of the best and the most important, so they believed that the rise and fall of destiny can be seen by it. As if everybody has their own minds and thoughts, the faces, the voice, body odor and habits are different, too. 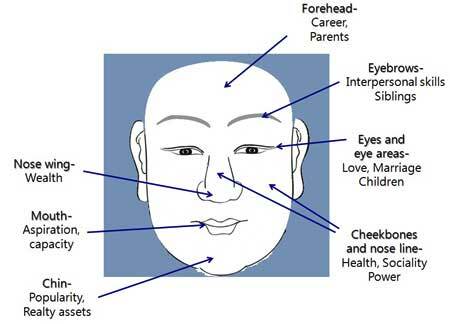 The environmental factors are added to one's face shaped by one's mind and genetic factors. And then the thoughts and behavior are supplemented to determine destiny. Although it's not easy to reshape an innate bone structure, it is definitely feasible to change face impression by mental attitude and effort. So, like water is shaped by its container, we also form our destiny in some degree. The face is a living form and keeps changing by our lifestyle and mindset. Faces with more protruding attributes have yang property and those with less protrudes have yin property. Yang types are adventurous, straightforward, firm and extroverted, while yin types are soft, more amicable and introverted so they are often indecisive. The five sensory organs in the faces are connected to the five organs. The eyes are linked to the heart and liver, the nose to digestive organs and lungs, the ears to kidneys and the heart, the mouth is related with to stomach and the tongue shows the condition of the heart. There are many interesting sayings about face reading. For example, people say that there is no beggar with a good-looking nose. That means that a nose shows one's money fortune. On the other hand, ears show one's dignity. The major readings of face parts are as below. Information: Are you interested in learning more about the ancient Chinese teaching about the "Four Pillars of Destiny"? Saju (Ancient Chinese Teaching ― Four Pillars of Destiny) or face reading workshops are held in Itaewon, Seoul Korea. For further information, contact Janet Shin at 010-5414-7461 or email janetshin@hotmail.com.